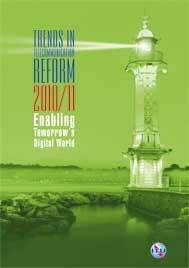 ITU released a major report on regulation in the information and communication technology (ICT) sector ! The annual "Trends in Telecommunication Reform" publications are key part of ITU´s effort to explore and amplify the wisdom of policy-makers and regulators in the ICT sector. The 11th edition will examine the challenges for regulators to stimulate nationwide broadband deployments through adaptive and targeted regulations and out-of-the-box tools, leading to a new ladder of regulation. With this regard, it is very important for regulators to understand the impact of broadband on and beyond the ICT sector as well as the driving forces of today’s and tomorrow’s ICT markets, notably the migration from analogue to digital terrestrial broadcasting and the allocation of the digital dividend. For markets to truly thrive, regulators need to prove successful in keeping up with the pace of convergence and integration of ubiquitous networks, in particular through adapting their institutional structure and mandate, adopting cutting-edge best practices and embracing new tools such as innovative dispute resolution techniques. The individual chapters will focus on salient issues such as the changing role of regulators in a digital world and their involvement in non-traditional areas of regulatory intervention, such as ICT climate change and cyberthreats. Last but not least, the Information Society is changing every aspect of our lives, whether in developing or developed countries and it is crucial to leverage the benefits it brings while mitigating the associated threats. What does it all mean for ICT users, but also for regulators and policy makers? The ITU World Bank ICT Regulatory Decisions Clearinghouse (ICTDec) is an online resource that provides a one-stop access point to decisions originating from ICT dispute-resolution decision making bodies. The ICT Regulation Toolkit is a web-based tool, organized as a series of online modules to provide regulators, telecom service providers, policy makers, sector experts and the general public with the latest developments on regulatory topics, best practices, and case studies.